For all its cynicism about its existence in the first place, last year’s first part of Peter Jackson’s adaptation of The Hobbit, subtitled An Unexpected Journey, was nowhere near the disaster it could have been, in fact it was actually rather good. However, almost everyone agrees that its near three-hour running time was far too long for a movie where virtually nothing happened at all, and while this reviewer never found it to be a problem with that first part – it took time to introduce new characters, establish necessary plot points and basically get us up and running for whatever follows – he would be lying if he said he didn’t understand why others would think so. That being said, the quickened pace for Part 2 – The Desolation of Smaug – is one element that audiences will immediately pick up on. Now that we’ve set up who and what’s going on, everything can charge full speed ahead, and that creates an incredibly entertaining fantasy action-adventure in its own right. We do not exaggerate when we declare that this film is heavy with action from start to finish. As soon as the opening credits are done with, we get a chase through the countryside, a man who can shape-shift into a bear – oddly enough, he disappears entirely after those scenes, leaving the impression he’ll have a much bigger role in next year’s third and final part, There And Back Again – a creepy trail through a haunted forest with giant spiders, and an escape/fight sequence as our vertically-challenged heroes ride down a river in barrels. Keep in mind, this is ALL within the first half. We haven’t even got to the Lonely Mountain yet, and already they’ve encountered every danger under the sun. It will please viewers looking for high-class and unpretentious entertainment, and thankfully these and other sequences – the barrel scene especially – are well directed and choreographed enough to keep anyone else hooked throughout the rest of the movie. They’re fun, enjoyable, and impressively put together. It’s pointless to talk about each actor individually, since a) there’s too many of them, and b) they’re all just as fine as they were in An Unexpected Journey. Some of the newer additions also stand out, including Luke Evans as an honourable family man who’s likable enough that you completely forget about the disheartening fact that he’s being played by Luke Evans, and Evangeline Lily as new elf character Tauriel who more than makes up for the lack of strong female elf characters in Jackson’s Lord of the Rings with her strong commitment and fierce presence. The unmistakable voice of Benedict Cumberbatch can be found twice in the film: most dominantly as the fire-breathing dragon of the title, and the mysterious “Necromancer” whose true identity should not come as a shock to those familiar with all things Tolkien. Both times, especially as Smaug, he excels with his irresistible booming voice creating a villain(s) memorable enough to have lasting power in the Tolkien fan community. We also get the return of fan favourite Legolas, once more played by Orlando Bloom, who actually gets a little more personality this time as opposed to the “pretty elf who swoons for the camera whenever possible” look he had going on. When you start to analyse it, however, there doesn’t seem to be much point in him being there (or at least not yet) but it’s passable because Legolas remains a very fun character to watch even with his most idiotic of death-defying stunts. No giant elephants this time, we’re afraid. In terms of effects, both the CGI artistry and the production design continue to be outstanding, but therein lays a very small flaw in the system, particularly with the VFX. 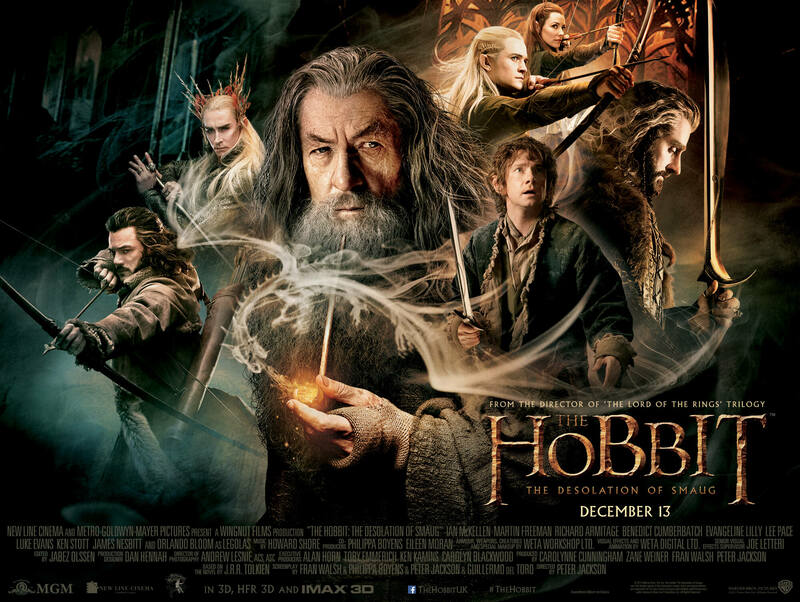 One of the other major criticisms about the Hobbit trilogy (so far) is of the over-reliance of CGI for backdrops and characters – not unlike George Lucas’ Star Wars prequels – as opposed to the practical effects of Lord of the Rings, and sadly those nit-picks aren’t completely uncalled for. There are times when its inclusion can get too much, and part of the illusion is jarred when we know we’re watching effects wizards do their stuff as opposed to really feeling like we’re in Middle-Earth. But that’s very rare when we feel that, and it does still use real New Zealand backdrops – wouldn’t be Middle-Earth without them good ol’ Kiwis – as well as impressive make-up and hairstyling for each of the dwarves. It is still incredibly beautiful to look at, whether it’s the red sky during numerous sunsets or the humongous halls of the dwarf kingdom of Erebor, and reminds us that there is no other real medium in which we can visually experience the world that Tolkien created. A creature such as Smaug, a giant fire-breathing dragon, could only have been done through computer-generated magic, and his design does not disappoint. Smaug is certainly one of the most entertaining movie dragons in a long time, a mixture of Cumberbatch’s voice and motion-capture performance and Weta Digital’s incredible visuals; though, it is a shame we do not get to see him in full until the final third of the movie. His reveal is exactly the same feeling you get when you see what Gollum looked like for the first time in The Two Towers, and for a moment it makes you uneasy but a few moments later of just getting sucked into Cumberbatch’s vocals and the CG effects you accept it as your new Movie CG God of sorts. These past couple of movies have been building up this winged beast for some time, and you can definitely see why. But just as we get accustomed to How To Train Your Tolkien for the duration of the final third, the film leaves us on a cliff-hanger (we won’t say what or when, but it’s a semi-big one). Undoubtedly, this will be what annoys audiences the most, abruptly leaving us in the middle of an intense situation akin to a Breaking Bad episode and then forcing us to wait another 12 months for the exciting conclusion. But, just as The Hunger Games: Catching Fire did last month, it leaves you heavily wanting more and raises anticipation levels through the roof for what they’re going to have in store for Part 3. Take our word for it: this time next year, audiences will be gnawing at their fingernails as they feverishly wait for the exciting conclusion. Fans of the book will of course know what happens next, but don’t let everyone else know: if The Desolation of Smaug is anything to go by, then we’re in for a wild ride that we should all wait patiently for to find out exactly how wild it will be. [SIDENOTE: This reviewer did not see this film in its advertised HFR 3D format of 48 fps so therefore has no opinion on it whatsoever, though they very much intend to see it in HFR at some point, and from what we hear it’s a more rewarding experience this time round].